VEEV @ $114.65 +1.38 (1.22%) currently has advanced strongly over the last month or two. In the month of January 2019 VEEV had advanced from about $82 to a recent high of $116. Writing covered calls (CC) has the problem of limiting the up-side gains of a stock. Investor’s compensate for the limited gains by rolling up the strike price to participate in the upward movement of the stock. The CC strike price for VEEV has been raised several times from $95 to $100 to $105 currently. And along the way the $95 protective put has been sold to avoid further time value decay. At the same time a covered call has been written and the stock price allowed to go ITM to provide some downside protection. Long term we are bullish on VEEV, but short term VEEV is vulnerable to a correction. This poses an additional question: should the roll be done before or wait until after the correction. The blue line represents the new position and the red line represents the current position as shown by the Simulate Trade Feature from the Position Analysis view in the Portfolio Tools. 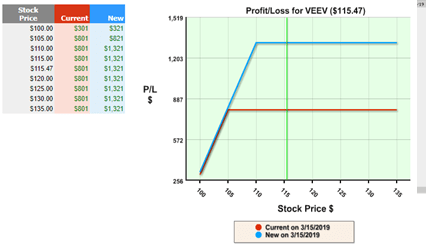 This alternative gave up the sure $796 (8.2% return) of the current position for the anticipated continued advance of VEEV and its higher returns. Hopefully this does not turn out to be too greedy! We liked the idea that the net credit increased but did not like the added time added for the call to expire. Longer term calls do not follow the stock price down as well as shorter term expirations. Therefore, we are also adding a stop loss alert at a $108 stock price. Now only time will tell if this alternative was the best one. The above analysis was done using the My Portfolio tools on PowerOptions. As you are tracking any position in the Portfolio tools you can link to the Position Analysis view and see potential Roll Out Opportunities, complete with before and after graphs of potential rolls to help with your rolling analysis.